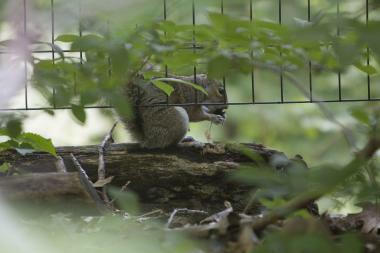 An agressive squirrel (not pictured) is on the loose in Prospect Park and has attacked five people since Friday. PROSPECT PARK — A potentially rabid squirrel has attacked five people in Prospect Park — and city health officials are urging anyone who was bitten to head to the hospital for emergency care. "This animal has exhibited extremely unusual behavior and we are urging anyone who has been bitten by it, including any pets, to go and see your doctor or veterinarian,” Health Commissioner Dr. Mary T. Bassett said Friday. The ravenous rodent attacked at least five people between July 18 and July 20 near the Parkside and Ocean avenues entrance to the park, according to a statement released by the Department of Health. Four of the people have been identified, and Department of Health Officials are urging the fifth person — who was bitten while jogging — to seek immediate medical attention, the agency said in statement. Squirrels are rarely infected with rabies, and the state has never identified a squirrel with the disease since it began monitoring animals with rabies in 1992. But officials are assuming this squirrel is infected because of its "unusual aggressive behavior," according to the DOH statement. Officials have posted warning signs near where the squirrel had been seen. There have not been any additional attacks reported in recent days, a DOH spokesman said Monday.